It wasn't too long ago that smoking was permitted nearly everywhere, from restaurant kitchens to plane cockpits, making it way easier to attempt to impress the cooler 8th grade pilots. 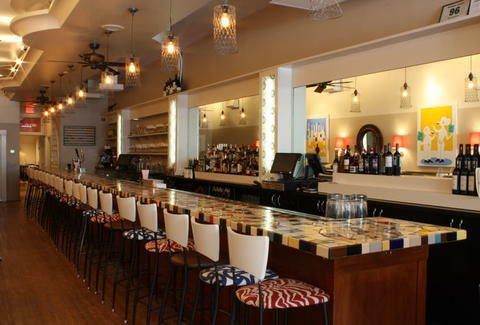 For a new wine joint taking over one of carefree smoking's last remnants, check out Ripple. Boasting a linen-lined, curtained rear dining room and a 40ft tiled bar backed by huge mirrors and flower-patterned lightboxes up front, Ripple's a casually airy, beige-walled winer n' diner built into the space previously occupied by one of DC's last remaining smoking lounges, who just couldn't hack it after sales dwindled due to the kids and their stingy new "puff puff pass" policies. Compensating for the lost vice, they're offering nearly 50 international vinos, stored in a walk-in glass fridge (formerly the humidor) and served by the glass (plus six in $6 6oz pours), and a first-rate beer list with 16 bottles (from Val-Dieu Triple to Geary's Wee Heavy), and taps like Allagash White, Great Lakes Dortmunder Gold, and Caracole Saxo Blonde Ale pumped from the "first ever disposable keg" -- and if throwing something out instead of reusing it hundreds of times isn't progress, what is? The food's equally top-shelf, with locally sourced small plates like Saba glazed pork belly with tuna/spinach/toasted sesame, spring lamb confit with Sea Island red peas & baby turnips, grass-fed rib eye with sauteed dandelion & red wine sauce, and the unique, creme fraiche-accompanied "Stinging Nettle Soup" (Poison Ivy Consomme coming soon!). They've also got a damn fine assortment of charcuterie (from Jamon Iberico to chicken liver mousse) and cheese (sheep, cow, blue, wash rind, and goat) including standouts like Holland's Midnight Moon Gouda and Pennsylvanian goat Pipe Dreams, also what you can call your idea of those 8th-grade pilots ever accepting you as one of their own, with your stolen Kools and inability to land anything bigger than a Cessna.